Low level laser therapy (LLLT) has been used in Eastern Europe and Asia for the treatment of a wide range of conditions for many years. Its continued acceptance in these populations reflects the efficacy with which it is regarded both by clinicians and their patients. Although there have been a substantial number of reports on its clinical benefit and some practitioners have used the technique in North America and Australasia it has yet to be subjected to detailed assessment through randomised clinical trials. The purpose of this review is to stimulate interest in the technique and to encourage rigorous research into its potential value. Low level laser therapy (LLLT) has been investigated and used clinically for over 30 years, mostly in Eastern Europe and Asia. The ability of lasers to cut, cauterise, and destroy tissue is well known throughout the medical world. However, its role at lower power is less well appreciated. The ability to non-thermally and non-destructively change cell function is known as laser biostimulation and is the basis for the current use of lasers in a number of medical fields. The worldwide interest in LLLT is illustrated by its use in more than 85 institutions in over 37 countries. Since the first study was reported in 1967, some 2500 papers have been published in a range of journals worldwide and the value of LLLT is much better reported than many believe. Its scientific background is sound enough to say that it is both safe and effective. However, positive double blind studies are unfortunately none too easy to find. Among the 100 selected for evaluation in this review, only 28 could be found on Medline. Many studies have been published in regional or national publications, which are not indexed on Medline or similar databases. The main reasons for this restricted publication include language barriers and lack of availability of professional journals because of financial constraints. Table 1 gives a summary of published studies of low intensity laser therapy for cardiovascular disease. Most reports are in Russian and the basis for clinical research and practice was first established in Moscow in 1986. The Institute of Laser Medicine was formed through a union of 14 laser centres from different parts of Russia. LLLT emerged as a potential therapeutic modality because of the conversion of military production into areas of commercial practice including medicine. The largest complex of laser research was founded in the closed city of Kaluga and in 1995 this was opened by order of the Russian government. As a result clinicians in Russia and Ukraine now have access to a wide variety of invasive and non-invasive lasers and there are numerous specialised laser centres throughout these countries. A wide range of laser applications have been used to treat large numbers of patients and in recent times up to 1.5 million patients have been treated annually. thrombosis in a pelvic vein or a deep vein of the legs. Mechanism of actions low level laser therapy. in strengthening the immune response. In addition, Ohshiro and Calderhead19 believe low intensity laser irradiation may work through effects on the central nervous system. They have suggested this occurs through tissue photobioactivation, in which the energy levels of biological structures are changed through light quantum absorption. Human tissue absorbs light energy and this stimulates and modifies metabolic processes. It results in reorganisation of protein polymers. In particular, it changes the structural and functional properties of cell membranes as well as fermentation processes. In this way it has some similarities to the action of sunlight in plant photosynthesis. From more than 10 years practical experience with low intensity laser irradiation in cardiology in Ukraine, it is clear that it offers new treatment possibilities. These include improved rheological characteristics of the blood and microcirculation as well as normalisation of hormonal and immune parameters.4,13,16,17 In particular LLLT can be part of a range of therapeutic modalities for patients with ischaemic heart disease, where it can reduce the risk of acute myocardial infarction. Over a period of 10 years one of the authors (TM) studied about 500 outpatients with this condition and 60% had laser treatment on two or more occasions. Some 70% of patients experienced a positive clinical benefit. Methodologically there are two basic techniques—intravenous laser blood irradiation (ILBI) by HeNe laser in the red spectrum and a simultaneous percutaneous low laser irradiation by laser in the infrared spectrum on to projections of reflexogenic and acupuncture areas. From practical experience TM believe this is the best combination for treatment, but it awaits confirmation in a double blind trial. Intravenous laser blood irradiation was developed experimentally by the Russian researchers, Meshalkin and Sergievskiy,20 and introduced into clinical practice in 1981. Originally the method was applied in the treatment of cardiovascular abnormalities. Reflexogenic zones (Zaharyan’s-Head’s areas) in angina pectoris. Reflexogenic zones or Head’s zones. Associated persons: G Zaharyan (1827–1897), Sir Henry Head (1861–1940). References: Head H. On the disturbances of sensation, with special reference to the pain of visceral disease. Brain 1893:16:1–133; Brain 1894;17:339–480; Brain 1896;19:153–276. Description: Zones of hyperalgesia of skin, associated with visceral disease. In 1883, Russian physician G Zaharyan discovered areas “allying organ representation”. Ten years later, Sir Henry Head was the first person to describe the reflex signs of disease, showing how any disturbance of internal function is quickly reflected to the external body surface, thereby giving notice of disorder, for example, attributable to referred sensation from the viscera, neck, and jaw pain can be seen in angina pectoris. In collateral irritation the organ disease causes a hyperaesthesia or pain in the skin areas whose nerves emanate from the same segment of the spinal column. Laser irradiation stimulation of such areas of “organ representation” may affect the physiological function of these organs through irritation of nerve endings. (Reproduced with permission of Meditsina, Moscow). The individualisation of doses of IV LBI is an important factor in guaranteeing successful treatment. This technique has solved the problem of “secondary aggravation” of disease during laser therapy. This phenomenon depends upon the initial exposure and output power of the irradiation. The initial dose should be minimal during the first procedure and then increased gradually up to the fifth procedure. For patients under 60 years old with coronary heart disease an output power at the end of the venous light guide should be from 2 mW to 4 mW, with an initial exposure of the blood for seven to eight minutes as the standard approach. There are subsequent increases in the exposure time of up to 15 minutes during the fifth procedure. For patients over 60 years the exposure is reduced. The usual parameters of blood irradiation for this group of patients are output power at the end of the venous light guide from 1 mW to 3 mW, with an exposure from five minutes on the first procedure up to 10 minutes during the fifth procedure. This simple method for individualisation of the course of laser therapy is based on observing the phenomenon of “scarlet blood”. This is seen when placing intravenous cannulas with their light guide into a vein. The appearance of this phenomenon during the third to fifth procedures of intravenous LBL coincides with the production of nitric oxide. Nitric oxide is an endothelial relaxation factor involved in the circulation of blood, immune function, communications between nerve cells, as well as rheological characteristics of the blood and coronary microcirculation. Nitric oxide plays a key part in the maintenance of vasodilatation and decreases high blood pressure. However, surplus nitric oxide is harmful and can cause oxidative damage. It is possible to limit these harmful effects by use of antioxidants, such as a complex of two vitamins A and E, (AEVIT).17 This “arterialisation” of patients’ blood means that the procedure should be suspended or carried out less frequently (every two to three days rather than daily). Sometimes symptoms of hypercoagulation are coincident with the appearance of “scarlet blood” and this can limit clinical efficacy. 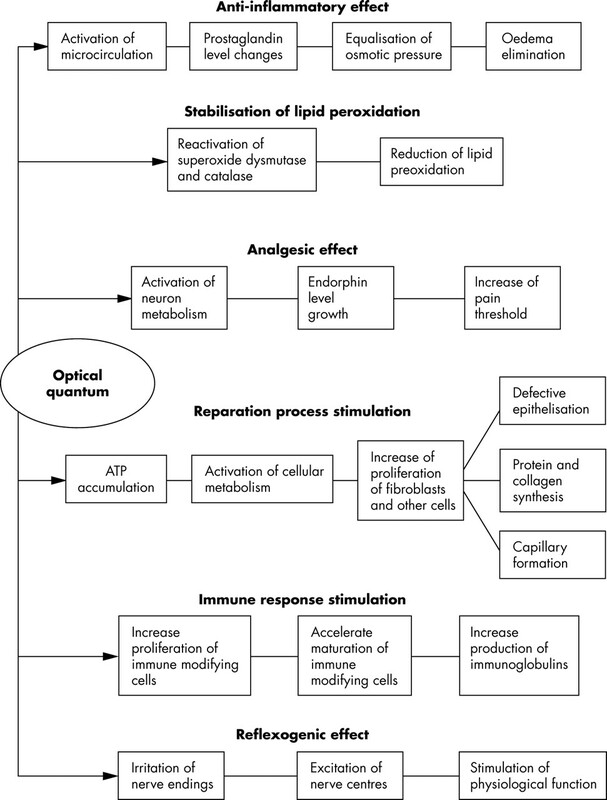 The biological effect of laser light on various conditions is complex and more research is needed to find the optimal parameters for treatment. Scientific research and clinical experiments on LLLT will help confirm whether it has a definite role in the treatment and prophylaxis of ischaemic cardiac disease. While some may regard LLLT as a magical electrotherapeutic panacea, and others consider it useless, there is a current need for clinical investigators to research these new laser medical devices. Additional research is needed to obtain data concerning success rates in treating specific conditions. This should include length of exposure, frequency of treatments, and related therapeutic protocols. The studies must conform to rigorous standards and clearly there is a place for double blind randomised control trials. It is only with robust data from such exacting studies that LLLT will come to be accepted as an effective modality of treatment. However, the clinical experience described in this paper should be a prompt to manufacturers of LLLT equipment to fund such work. Cheng N, Van Hoof H, Bockx E, et al. The effects of electric currents on ATP generation, protein synthesis, and membrane transport in rat skin. Clin Orthop1982;171:264–72. Kapshidze N. Treatment of ischemic heart disease by HeNe laser. T’bilisy: Amirany, 1993:197. Loser R, Zcarev O. Intravascular laser irradiation of blood in the multimodality treatment of patients with obliterating disease of the lower limb vessels. (Abstract). Samara, Russia: Samara Medical University, 1991. Ruzov V. Pharmacological and laser correction of haemorheologic disorder and microcirculation in patients with ischaemic heart disease.Vopr Kurortol Fiz1996;5:5–7. Kovalyava T. Ambulatory application of combined laser therapy in patients with diabetes mellitus and dyslipidemia. Laser Partner2002;46. Knjazeva T, Badtieva V, Zubkova S. Laser therapy in patients with combination hypertension and coronary heart disease. Vopr Kurortol Fiz1996;2:3–5. Mihno L, Krivoruchenko A. Laser therapy in patients with coronary heat disease. Med Reabil Kurortol Fiz1996;2:55–61. Ionin A, Volkova E. Intravenous use of low-energy helium-neon laser irradiation in unstable angina. Sov Med1989;8:17–19. Kulbaba I. Laser and magnetic-laser therapy in the complex of treatment of the patient with stable angina. (Abstract). Odesa, Ukraine, 1994:22. Pashnev V, Lavrent’en I, Podvigin A. The efficacy of intravenous laser therapy of patients with ischemic heart disease at a day hospital of a polyclinic. Voen Med Zh1989;12:38–9. Tam G. Low power laser therapy and analgesic action. J Clin Laser Med Surg1999;17:29–33. Sychev O, Tashchuk V. Intracardiac laser irradiation in the correction of left ventricular dysfunction in patients with progressive angina pectoris. Vrach Delo1999;7–8:41–4. Karandashev O, Petuhov V. Changes in the rheological activity of the blood due the He-Ne laser irradiation. Moscow: Scientific centre of cardiac-surgery, 1995. Vasiliev A, Streltsova N. Low-level laser therapy in patients with ischaemic heart disease and possible mechanism of hypolipidaemic action. Vopr Kurortol Fiz1996;1:37–8. Simonenko V, Sych N. Diagnostic implication of changed red cell counts in low- intensity laser irradiation of blood in elderly patients with coronary heart disease. Klin Med2002;14:31–3. Kapshidze N. Lectin-induced chemiluminescence of neutrophilic granulocytes in the peripheral blood of patients with myocardial ischemia prior to and following He-Ne laser blood irradiation. T’bilisy: Amirany, 1994. Kapustina G. Intravenous laser therapy, the main landmark in scientific research. Medical Equipments and Medical Products2003;2. Volkov V, Volkov T. Treatment of ischemic heart disease with low-level laser therapy. Laser Partner2000;8. Ohshiro T, Calderhead R G. Progress in laser therapy. Chichester: Wiley, 1991. Meshalkin E N. Primenenie prëiìamogo lazernogo oblucheniëiìa v çeksperimental§noæi i klinicheskoæi kardiokhirurgii: sbornik nauchnykh trudov. Novosibirsk: Vychislitel§nyæi ëtìsentr SO AN SSSR, 1981. Denisjuk V, Kolesnik A. Use the intracardiac laser irradiation of blood to increase of clinical efficiency of anti-arrhythmic drags in patients with fibrillation and atrial flutter. Liki Ukraine2:50–2. Gelfgat E, Abdulova R, Babaev Z. Helium—neon laser used in drug-resistant cardiac arrhythmias. Kardiologija1992;2:66–8. Tunér J, Hode L. It’s all in the parameters: a critical analysis of some well-known negative studies on low level laser rherapy. J Clin Laser Med Surg1998;16:245–8. Korochkin I M, Kapustina G M, Babenko E V, et al. Helium-neon laser therapy in the combined treatment of unstable stenocardia. Sov Med1990;3:12–15. Gasparyan L. Laser irradiation of the blood. http://www.healinglightseminars.com/listing/Blood_Irradiation.pdf. Simonenko V. Evaluation of laser radiation in red and infrared diapasons in the treatment of patients with unstable angina pectoris. Med Rehabil Kurortol Fiz1996;1:10–14. Kniazeva T, Nosova L. The development of systems for the early rehabilitation of patients with ischemic heart disease following aortocoronary bypass. Vopr Kurortol Fiz1997;8:8–11. Rasumov A. Laser therapy as a method of elimination of tolerance to nitrates and increase of their action. Questions of Kurort and Physiotherapy2000;5:3–5. Ugdoz V, Kulbaba I. A comparison of different modalities of helium-neon laser therapy in patients with stable angina pectoris. Lik Sprava1996;1–2:73–4.